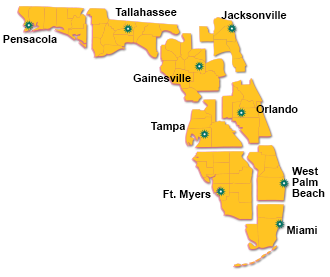 Florida Lottery Headquarters are located in Tallahassee, and there are eight additional District Offices to better serve our players throughout the state. Click on any of the District Office locations listed below for maps and driving directions. Read more about claiming Lottery prizes. To become a retailer, please call or email the District Office nearest you. Lottery offices are open for sales and prize claims Monday through Friday from 8:30 a.m. - 4:00 p.m. ET (except for the Pensacola office, which is open 8:00 a.m. - 3:30 p.m. CT). Lottery offices are open for all other business from 8:00 a.m. - 5:00 p.m. ET (except for the Pensacola office, which is open 7:30 a.m. - 4:30 p.m. CT). Please note that offices are closed on all State of Florida holidays.